NEW YORK (Reuters Breakingviews) - Maybe U.S. workers are finally getting the upper hand. A spate of protests by staff at companies as varied as Alphabet-owned Google and McDonald’s have taken aim at their employers’ failure to tackle sexual harassment issues. Meanwhile, the latest U.S. jobs data show unemployment still ultra-low in October and wages up the most year-on-year in almost a decade. That’s one reason the targeted companies’ executives have to listen. 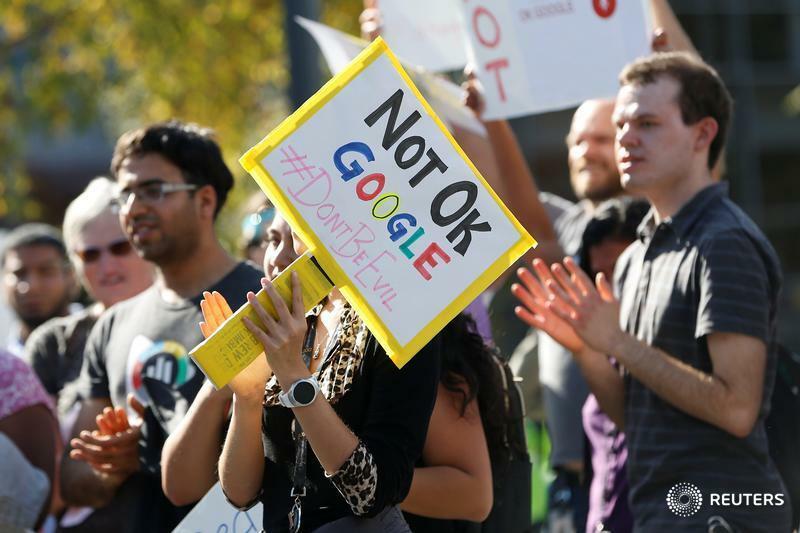 Thousands of Google employees around the globe walked out of their offices on Thursday, underscoring their disenchantment with the Silicon Valley giant’s lack of diversity. The company had handed top executives lavish exit packages – one tallied US$90 million – after they were accused of bad behaviour, the New York Times reported last week. The organizers’ demands included appointing an employee representative to the company’s board. Googlers are notably vocal. Staffers managed to blow up a deal with the Pentagon earlier this year because they didn’t want to be involved in providing technology for lethal purposes. But workers at other types of companies are challenging their bosses too. Hundreds of McDonald’s rank-and-file employees across the United States marched off the job in September, displeased that issues including the safety of women at the company were not being addressed. The concerns of women in the workplace are getting attention that’s long overdue. Yet a labour market that is tight overall may also help workers feel emboldened. The U.S. economy added a healthy 250,000 jobs in October, the Bureau of Labor Statistics reported on Friday, while the unemployment rate remained at 3.7 per cent, consistent with many estimates of full employment. The jobless rate among those with a bachelor’s degree or higher is even lower. There were a record 7.1 million job openings in August, the BLS said in mid-October. Perhaps most significantly, the employment data for last month suggests wage growth has finally set in: the annual increase of 3.1 per cent in hourly pay was the biggest since April 2009. Google boss Sundar Pichai sounded contrite and supportive of his protesting employees at a New York conference on Thursday. He and fellow top executives at other companies might feel that way anyway, and for many reasons. But there is more at stake for their businesses when workers become a scarce commodity.